San Francisco de Asis Church rises against the deep blue sky. There was an autumn 10 years ago when I was ready to move to Taos. I had made friends here and fallen hard for hikes in the Sangre de Cristo Mountains by day and raucous conversations over margaritas by night in Taos’s de facto living room, the Adobe Bar. Streets of curving adobe walls captured what I imagined pre-“Santa Fe-style” Santa Fe to have been. Taos seemed covered with a literal and figurative layer of dust that hinted at its grit and authenticity. Infatuations were common for me then, and I suspect Taos was another – ephemeral but intense, like the New Mexico light that has drawn artists for more than a century. I was hardly the first to fall under Taos’s spell. Now I’m back in another fall, this time with my wife, Becky, and all the old sensations of Taos come alive again. The cottonwoods are aglow, clad in October gold. Their leaves shimmy in the breeze, fluttering to the ground where they tumble down the street and crunch underfoot. 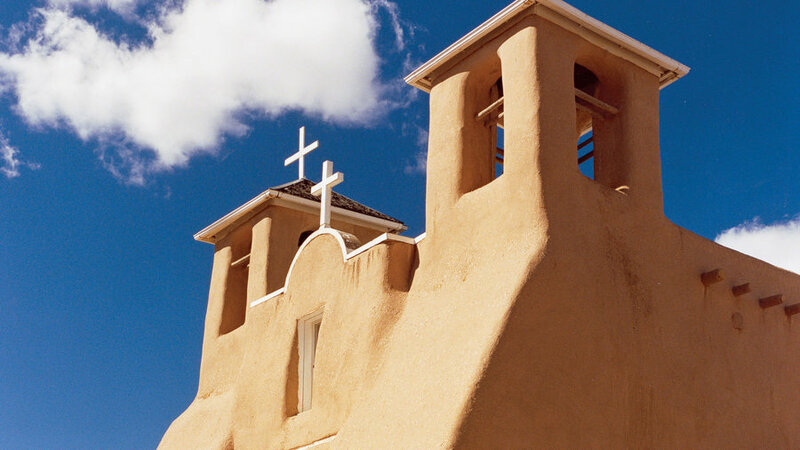 Lured by the promising twilight, we head to San Francisco de Asis Church, an 18th-century structure that, thanks to Ansel Adams and Georgia O’Keeffe, became a modern art icon ― and a quintessential Taos landmark. The now-famous view is not the twin bell-towered entrance but the back, where the shadows exaggerate the rounded buttresses and lines. As my Ansel moment arrives, I’m set to shoot when a battered blue pickup with a pair of barking dogs ― nearly as dinged up as their ride – pulls over and parks in the middle of the frame. The photo op is gone but a fresh one has appeared, a reminder of what made me originally take to Taos. At a time when so many towns have become soulless clones of one another, Taos, with its creative heart, natural beauty, and ancient roots, delivers an inimitable experience. One that’s most captivating when you surrender to its unpredictable and eccentric magic, which is most tangible in autumn, when Taos truly belongs to the Taoseños. Typical of Taos’s often contrarian ways, the Rio Grande Gorge, the area’s most famous natural landmark, is virtually invisible. Until you reach its edge. Walk across the bridge and you gaze into an abyss framed by dark walls of volcanic rock ― all the way to the muddy band of the Rio Grande 650 feet below. As we hike the gorge’s west rim, it’s not this great rip in the earth that commands our attention but the sky. Billowing clouds, like a cinematographer’s dream, cast shadows across sagebrush plains. To the east, the Sangre de Cristos, marbled yellow and orange by aspens, rise more than 13,000 feet, dwarfing Taos. We’re bound for the Hotel La Fonda de Taos to check out the menu at Joseph’s Table, one of Taos’s best restaurants, but get diverted after spotting a lobby sign announcing an art trove sequestered in the hotel: the forbidden paintings of British novelist D.H. Lawrence. Lawrence was among the artists drawn to Taos in the 1920s by socialite turned salon hostess Mabel Dodge Luhan. A La Fonda owner acquired the paintings years after 13,000 people flocked to be shocked at a 1929 London showing before officials banned the paintings. We learn this from Paxton Noble, a hotel employee, before he opens a curtain, and whoosh, there they are: nine paintings by one of the 20th century’s greatest writers, not in a museum but unveiled for a private viewing in a conference room off a hotel lobby. The paintings’ emotional rawness is more stunning than their eroticism. That said, it’s still easier to converse once Paxton closes the curtains. As it turns out, his father is Tom Noble, an artist and Taos native, whose luminous quill-pen-and-watercolor landscapes had caught our attention as we gallery hopped earlier in the day. Paxton recommends that we check out Ledoux Street, and so, before dinner, we walk over to this increasingly vibrant Taos arts district. Seeming to beckon us inside to an exhibit opening, a magpie calls and flashes its black-and-white wings from a viga at the 203 Fine Art gallery. Art openings are a big deal in Taos, a kind of episodic party that reconvenes as a new show debuts. This one is for Alvaro Cardona-Hine, a native Costa Rican and, as a writer, painter, and composer, a most versatile Taos creative hyphenate. The party swirls about him as the gallery, located in a renovated 150-year-old adobe, fills with locals and fellow artists. In many respects, Taos is a complex blend, a veritable posole that mingles diverse communities: the arts crowd and ranchers, old Spanish families and New Age seekers, Hollywood expatriates and 1960s refugees who have lost none of their counterculture ways. And predating these folks by hundreds of years is Taos Pueblo. More than 1,000 years old, it’s said to be the country’s oldest continuously inhabited community. If you rush through Taos Pueblo, the two multistory structures ― with their ladders and irregular assemblage of rectangular rooms – may at first seem more stage set than authentic. But what distinguishes Taos Pueblo from fellow UNESCO World Heritage Sites such as the Acropolis and the Taj Mahal is that it remains a living place, the center of life for its people. We wander dusty alleyways, past buff-colored homes unadorned except for front doors in faded pinks and blues and the occasional pair of cornstalks. We watch the comings and goings of dogs and children and guys patching up adobe walls as we listen to the flow of Red Willow Creek, which still provides the pueblo’s drinking water. By this point, I’m due for my own Taos homecoming, so we stop for dinner at the Adobe Bar. Walking in, I’m reminded of reconnecting with an old friend after several years, one of those moments when the conversation almost seems to pick up midsentence. A jazz group is playing, and as the keyboardist solos, the trumpet player passes time browsing through the brochure rack off the lobby. It’s a typical Adobe Bar crowd, which is to say that there’s no discernable pattern, certainly not in the headwear, which includes cowboy hats, trout-fishing caps, and the broad-brimmed floppies favored by river guides. Among them, though, is one woman wearing a white mink collar and two from Texas who have broken out their finest O’Keeffe/Frida Kahlo drag for their Taos sojourn. “I think every day is a church day,” one says. “Well, if not a church day, then certainly a spiritual day.” Which proves to be a surprisingly prescient comment. Later that night, as the breeze dies down, a sound comes up ― at first distant, then intensifying. The rhythmic thumping of drums and the hypnotic chants of a ceremony at Taos Pueblo carry miles through the silence and into our open windows. Morning arrives with a dying drizzle that sends dark streaks down the adobe walls and scatters newly fallen yellow leaves around the courtyard. I head out for the gorge, but, of course, never get that far. Outside town, the morning brightens as a curtain of sunlight flows into the valley from a gap in the Sangres. Fog rings the mountains about halfway up, revealing high peaks white with the first snow of the season. A pinkish gold radiance spreads across the valley, illuminating every leaf and reddening the russets of pasturelands. Sheep graze as church bells clang somewhere in town. It’s reminiscent of the landscapes by Tom Noble and other Taos artists, works that seem to have a fantastic quality more the product of imagination than anything else. Those colors can’t be true, right? The sky doesn’t actually swirl in diaphanous shades of violet over the mountains. But the boundaries between the mystical and the material are often blurred in Taos. When you read accounts of early artists, they speak of a place to touch the divine, of Taos’s magnetic power. I’m not sure what to call it. But looking up at the sky, all I can say is that whatever nearly pulled me here 10 years ago isn’t about to let go anytime soon.